TV credits sequences, from Beverly Hillbillies to Unbreakable Kimmy Schmidt to Arrested Development to iZombie. Why elaborate, explanatory opening sequences are making a comeback on television. 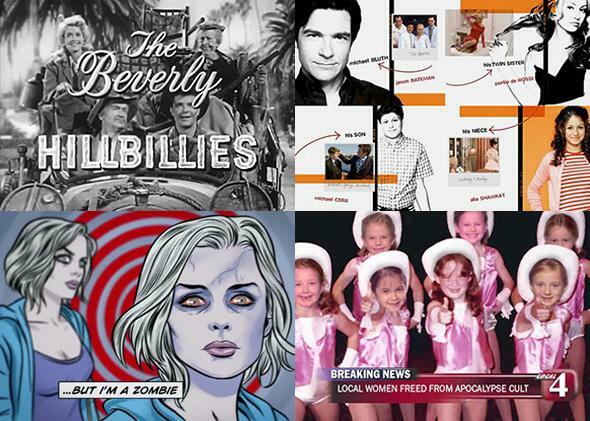 Clockwise from top left: The Beverly Hillbillies, Arrested Development, Unbreakable Kimmy Schmidt, and iZombie. Composite image by Slate. Stills via CBS, FOX, Netflix & The CW. I’m not a superhero. I don’t technically have any superpowers, but I come pretty close in my ability to remember TV theme tunes. I can whistle the melodies of shows I haven’t seen in decades, and identify them by the briefest glimpse at the credits. None are embedded quite as deeply in my noggin, though, as the programs that explain their premise in an opening sequence, often with the help of a catchy ditty. Strangely, in an era when title credits are shrinking into nothingness, backstory-explicating openers are making a comeback. This year, the Netflix comedies The Unbreakable Kimmy Schmidt and Grace and Frankie and the CW’s supernatural crime drama iZombie have all featured longish, plot-summarizing opening sequences. These programs tell very 21st-century stories—of an indomitable woman’s cheerful struggle to move past a traumatic experience, the knock-on effects of two seventysomething men’s announcement that they’re in love and want to get married, and a comic-book-inspired tale of a physician who solves murder mysteries by eating the victims’ brains—but they all begin each episode with credits that are both intensely modern and totally retro. The heyday of this kind of sequence came in the 1960s, when a host of TV sitcoms set up their stories with a song. None is more memorable than The Beverly Hillbillies’ “The Ballad of Jed Clampett,” which features the bluegrass stylings of Lester Flatt and Earl Scruggs, lyrics that explain how a poor mountaineer got rich, and introduces viewers to the kinfolk who advised him to move to the land of swimming pools and movie stars. In less that a minute, the show’s producers saved themselves from ever having to remind us why the Clampetts keep talking about moonshine and possum instead of overall deals and kale salad. As charming and unforgettable as many of these openers are, some can seem redundant. It’s possible that the very first viewers of Mr. Ed needed to be told that the handsome palomino who appeared when the stable doors opened was the show’s title character, but I’m guessing word spread pretty quickly. At one point or another, everyone who has ever stepped onto any kind of watercraft has sung “a three-hour tour” while waiting to board. Gilligan’s Island was an exceedingly silly show, but its opening number was pure genius. The sea shanty vibe of “The Ballad of Gilligan’s Isle” is musically appropriate, and the song did the legwork of introducing all the characters (at least after the second season, when the professor and Mary Ann were name-checked) and explaining how they ended up on that uncharted desert isle. I’ve never seen an episode of The Brady Bunch, but I know what it’s about, thanks to the absolute clarity of the theme song, which was even more adorable from the second season on, when the kids sang the account of how their families came to be blended. Like The Beverly Hillbillies and Gilligan’s Island, The Jeffersons’ theme song is particularly effective because it’s performed in a musical style evocative of the show’s characters. As the gospel-inflected “Movin’ on Up” celebrates their “deluxe apartment in the sky,” we see Louise and George Jefferson expressing trepidation and excitement about their move uptown. At this point, few of us recall that The Jeffersons was a spin-off from All in the Family or that they were moving away from the Bunkers’ neighborhood in Queens—we’re just glad they finally got a piece of the pie. Premise-explicating openings were never as popular for dramas, though Law & Order’s explanation of how the criminal justice system works comes pretty close. The Six Million Dollar Man was a rare exception. Thanks to this sequence—lengthy even by ’70s standards—new viewers knew Steve Austin’s profession, that he was once “a man barely alive,” and that we have the technology to rebuild him. They even get a reminder of which of his body parts are bionic and how much his treatment cost. Explanatory opening sequences almost disappeared after The Simpsons’ tour of Springfield first aired in 1989. But in 2003, the Fox series Arrested Development laid out its premise—a wealthy family had lost everything, but one son was battling to keep them together—introduced the actors and the relationships between the characters they played, and ended with a flourish unheard of since the days of The Streets of San Francisco (a Quinn Martin Production): the narrator saying the title of the show. When Arrested Development was revived by Netflix in 2013, a complicated production schedule meant that each episode came from a different character’s perspective, and the producers cleverly tweaked the opening credits to reflect that. As credits sequences shrank, many of the beloved elements—like catchy tunes and meta-references—were lost. But in the last year, a few shows have started to buck that trend. The Netflix comedy Grace and Frankie puts two pairs of wedding cake toppers through their stop-motion animation paces to show business partners falling in love and leaving their wives. Unfortunately, it tells the story so effectively, it makes the show’s exposition–heavy first episode, the least funny of the season, seem redundant. By now we’re used to long, sometimes self-indulgent, opening credit sequences on shows made for streaming services like Netflix or premium channels like HBO. After all, they don’t have to sacrifice any of their precious running time for ads. This spring, though, the CW’s smart new procedural iZombie introduced a classic premise-explaining opener. Drawn by Michael Allred, the artist behind the comic book from which the show is loosely adapted, the credits reveal a lot of backstory: how Dr. Liv Moore joined the undead, who her friends and ex-lovers are, the source of her investigative insights, and how she’s able to share them. It’s a masterpiece of concise storytelling. This retro revival is easy to enjoy but hard to explain. Back in the early days of television, before home-recording devices and binge-enabling streaming services allowed people to catch up on TV, producers had to repeat their setups over and over so new viewers wouldn’t feel lost. That’s no longer necessary—old episodes and plot summaries are just a few clicks away. Now we can enjoy plot-establishing credit sequences on their own merits, and when we get sick of seeing them, we can always hit the fast-forward button.